Autumn in Hendricks County provides a plethora of things to do, and one ever-increasingly popular fall tradition here is the Indiana Short Film Festival, which will be held Oct. 9-11 at the Royal Theater in Danville. In its fifth year, the Indiana Short Film Festival is already a big deal. For starters, it&apos;s the only festival in Central Indiana that is dedicated entirely to short films. Up-and-coming filmmakers from all over the world will have their short creations -- they must be no more than 40 minutes in length -- shown during this three-day event. The Indiana Short Film Festival is also critically acclaimed. In 2014, Audience Awards named it one of the ten best short film festivals in North America. In fact, it came in at No. 4! The setting for the Indiana Short Film Festival couldn&apos;t be any better, either. 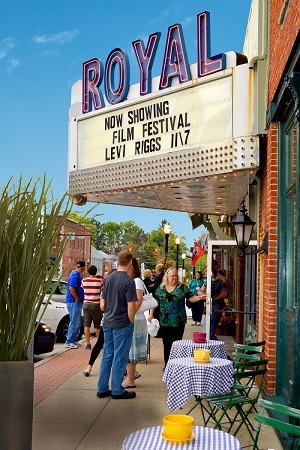 The Royal Theater is located on the east side of the historic Hendricks County Courthouse Square in the cozy, Mayberry-esque town of Danville. The theater has been serving Hendricks County since 1914, and its ongoing renovations and friendly staff provide a perfect historic, comfortable, small-town feel to the festival. So what does the 2015 Indiana Short Film Festival have to offer? I&apos;m glad you asked. The first session of the festival features eight films that total 97 minutes of short film bliss. The film in this series that jumped out at me is "Unfair Game," which is about a German sniper holed up in an abandoned building waiting for his enemy to arrive. To read about all of the films being shown in Series A, click here. Series B offers 10 films that total 96 minutes of viewing pleasure. The film "At Me or With Me," described only as "even the worst of us are capable of good intentions," has piqued my curiousity. For a listing of all the films in Series B, click here. In Series C, nine films total 97 minutes of run-time, and the movie "Haley Jane" sounds really interesting. A woman disappears for a decade, her body is never found, and no one is criminally charged. But now she&apos;s coming home. To see the rest of the films offered in Series C, click here. With eight films totaling 98 minutes of entertainment, Series D offers the film "I Killed Grandma (J&apos;ai tué ma grand-mère)." Who could not be interested in seeing a movie with that title? To see everything that Series D has to offer, click here. Series E weighs in with 98 minutes of big-screen magic spread over eight films. "Come Away With Me" is one of the films, and it tells the story of an interracial couple who were sweethearts in the 1960s and who reconnect years later at a high school class reunion. To see all of the films on Series E&apos;s slate, click here. For a list of Saturday Night Fright&apos;s films, click here. For these six short film showings, you have the choice of purchasing $7 tickets for a single session, or just take in the whole festival with a $35 weekend pass. You save yourself $7 per person, plus you gain entry to a private meet-and-greet with the filmmakers! New this year, high school and college students get even more of a discount with $5 for single admission or $25 for a weekend pass. It&apos;s easy (and wise) to purchase tickets in advance by clicking here. The Indiana Short Film Festival doesn&apos;t end on Saturday night, though! There are two more sessions on Sunday that are free to the public and that feature only Indiana filmmakers: Hoosiers Only Series 1 at 1:30 p.m. and Hoosiers Only Series 2 at 4 p.m.
Doesn&apos;t the Indiana Short Film Festival sound like an inexpensive and fun reason to spend a fall getaway weekend in Hendricks County?